Preventing Medical Errors in Behavioral Health is a 2-hour online continuing education (CE) course that examines the ways in which clients can be harmed in mental health practice, and the many strategies for anticipating and avoiding such undesirable outcomes. This course is intended to increase clinicians’ awareness of the many types of errors that can occur within mental health practice, how such errors damage clients, and numerous ways they can be prevented. 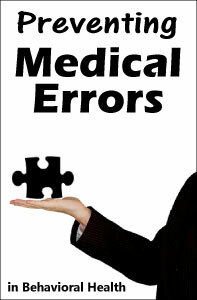 Its emphasis is on areas within mental health practice that carry the potential for "medical" errors. Examples include improper diagnosis; breaches of privacy and confidentiality; mandatory reporting requirements; managing dangerous clients; boundary violations and sexual misconduct; the informed consent process; and clinical and cultural competency. There are major new sections on psychotherapy in the digital age, including the use of social networking systems, the challenges of maintaining and transmitting electronic records, and engaging in the practice of teletherapy. *This course satisfies the medical errors requirement for license renewal of Florida mental health professionals.